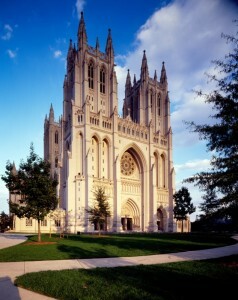 In 2011, the Washington National Cathedral suffered extensive damage from an earthquake. As it is a solid masonry structure that took over 83 years to construct, the repair process has been long and expensive. Recently, the cathedral finished up its first phase of repairs which cost about $10 million. Now, repair crews are heading onto the even more daunting and expensive second phase. This phase will focus on the exterior of the building, such as damaged gargoyles and twisting pinnacles. All in all, the second phase could take a decade and cost $22 million. According to the director of preservation and facilities, you really can’t tell the extent of the damage from the ground. Jim Shepherd told the Religion News Service that it’s not until he takes visitors to the cathedral’s heights that they truly understand the cost of the repairs. While the price may seem high, it’s amazing to think that the entire cathedral was made and is being repaired by hand. This entry was posted in Articles, News on February 25, 2015 by Boom Visibility.